Iran needs to keep the United States, still referred to as the “Great Satan”, as its enemy for the Islamic Republic to survive, an Iranian-American scholar wrote. Iranian supreme leader Ayatollah Ali Khamenei speaks at the IRGC military academy. “In his latest speeches, Iran’s supreme leader Ayatollah Ali Khamenei, has been emphasizing on how the Islamic Republic should focus on confronting and resisting its “enemies” and how Iranian leaders should not trust Iran’s enemies under any circumstances. Since the establishment of the Islamic Republic in 1979, Teheran’s message has been consistent that the Islamic Republic faces existential threats and enemies. Iran’s state-owned media outlets have been spreading the same message and narrative. For Iran, the U.S. and Israel have been consistently considered as major enemies, while Iranian leaders have also added other regional nations their list of enemies in various periods. But why does the Islamic Republic have to constantly remind its population of the “enemies”? 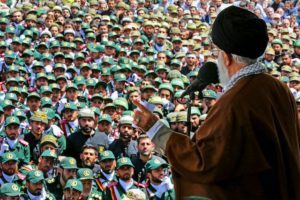 The long-standing Iranian leaders’ narrative that Iran faces enemies has been consistently manifesting itself in Friday prayers, speeches that Iran’s Supreme Leader, Ayatollah Ali Khamenei delivers on a regular basis, as well as the general of Iran’s Revolutionary Guard Corps (IRGC), mottos of the state’s semi-militia group Basij, and so on. Coining labels for the enemy such as the “Great Satan” has also been engraved in the political ideology of the system. Children are taught from an early age, through the educational system and books, about these dangerous “enemies”. The state’s media outlets persistently reiterate who the “enemies” are, why they are the enemies and generally bashing them. As Mina, an Iran-based political scientist pointed out “almost 90 percent of Iran’s news is focused on warning the people about the regional and global enemies, bashing the US, Israel or other states in the region such as Saudi Arabia, and the rest of the news is about spreading Shiite theology, mourning the death of Shiite leaders, showing that the Shi’ite are the victims, and showing how Iran is the only good country in the region”. In other words, by looking at Iran’s policies since 1979, one can observe that Iran has methodically, systematically, and effectively used the concept of “enemy”. Having powerful “enemies” serves very well as a social, political, strategic and economic scapegoat for Iranian leaders. Without an “enemy” how can the Iranian leader justify cracking down on opposition? Without the existential “enemy”, how can Khamenei and the IRGC explain the large military budget? Without the “enemies”, how can Iranian leaders distract attention from the accumulation of wealth at the top and the large amount of poverty in Iran? Without the “enemy” how can General Qassem Soleimani and Khamenei explain the intervention in Syria, Iraq, Lebanon, Yemen, Bahrain? Without these enemies, who will the Iranian leaders blame for the fact that over half of Iran’s population are surviving under poverty line? With no “enemy”, how can Iranian leaders maintain the core of their revolutionary principles and the Islamic character of the state? If there is no “enemy”, how will Iranian leaders take attention away from the day-to-day difficulties that Iranians face? Without the “enemies”, from which social base would Khamenei obtain his legitimacy? Without the “enemies”, how can the IRGC brutally crack down on domestic oppositions and turn its military institution into a regional empire? Iran’s military budget continues to increase, although Iran has not been attacked by any state or non-state actor in the last three decades. The most important reason lies in the notion that Iranian leaders have methodically and systematically used the “enemies” as a scapegoat and a tool to more easily justify a crackdown on any opposition domestically. In the first few years after the revolution, Iran consolidated its power by labeling the opposition as the enemies (Americans, Israelis or Iraqis), conspirators and traitors. This gave the state the legal platform to eliminate the opposition. This approach has continued until the present. From the military perspective having an enemy has given the top gilded circle of Iranian leaders the excuse to accumulate wealth through utilizing most of the budget, revenues, the nation’s resources and wealth. Not only the wealth gets accumulated at the top, but also the increasing power and capacity of Iran’s military will ensure that the ruling leaders can suppress the opposition domestically, pursue Teheran’s regional hegemonic ambitions, and deter any possibility of foreign intervention that might endanger the government’s hold on power. Having an “enemy” for Iranian clerics is a powerful tool to unify the population, create the “other”, divide and rule, and more easily control the population by identifying the “deviants” from the supporters of the religious rule in the country. Having a powerful “enemy” is a method to rule by invoking nationalistic sentiments through instigating hatred and fear. The most prominent example of application of this method in the modern history would be the Nazi Party. However, the Islamic Republic not only invokes the nationalistic sentiments but also the revolutionary ones. This creates a powerful force behind the government. This method is much easier than unifying people and galvanizing support by focusing on resolving domestic issues. When you have an “enemy”, people across the political spectrum support the government. It creates blind patriotism. The Islamic Republic can better define its ideological political identity by positioning itself on the good side and projecting the enemy as barbarian, demonic, malicious, and immoral. By showing that the enemy is the oppressor, Iran describes itself as the oppressed which gives immunity to the ruling clerics in order to commit any acts for “self-defense”. The Islamic Republic is also a religious revolutionary state. Two of its core values are standing against the “enemy” and viewing things from the prism of being either on the side of evil or the benevolent. A religious revolutionary state can either turn into a force of goodness or it can become a paranoid state. The Islamic Republic is a paranoid and religious revolutionary state that analyzes things in a binary paradigm: If you agree with their ideology, you are good (you can be a communist, capitalist, or theocrat). If you disagree with them on anything, you are not only an enemy but you need to be wiped out and suppressed (even if you are one of the founding members of the government). For this kind of government, there is no middle ground, there is no compromise.